You can now purchase Enchanted polishes from Llarowe and I think maybe her Etsy shop too, but I am not 100% now. Laaavely!! And your fingers look cute hehe! oh my god! this is gorgeous! I love that bright pink and yes, it looks AMAZING on you!! I want this polish now!! Oh wow, this is amazing, omg! *w* I LOOOOVE it! <3<3<3 I want! OHMG this is absolutely stunning - and as girly as it gets, I absolutely love it! It's so sparkly and gorgeous! Lovely!!! Super girly and fun! Oh I love this!! I have been wanting a hot pink holo. I just looked at the Enchanted holos on Llarowe and OMG they're all so gorgeous and amazing!! I wish I could have so many of them!! This polish is so stunning!! Oh this is such a perfect pink polish - want it, no NEED it!!! Omg!!!! I need this baby in my life! It's so gorgeous on you Iris. I love it! OMG!! Gorgeous!! Pink isnt my favorite but I love this! It looksso good on you. The name is perfect too. Wow cant believe no top coat. Oh my lordy! I am not, by any means a pink girl, but this is so stunning! Wow... 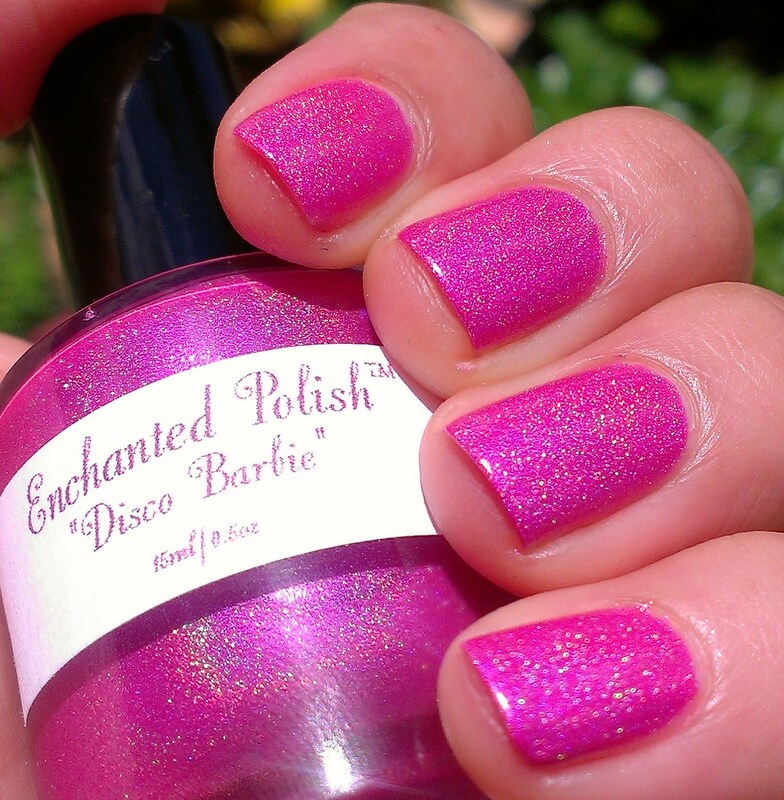 I love pink, I love holos, this is a top one for me! This really is pretty-yes I know it's pink-but there is something about this particular pink that is awesomesauce! Gorgeous polish! I love the name, it's so... accurate, lol! oh I have wanted this one for so long!